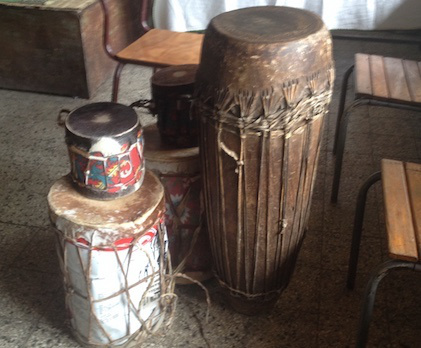 BUUL: "Buul" is a term that the Anywaa and Nuer use for drums. In Gambella, both ethnic groups use a similar construction style. 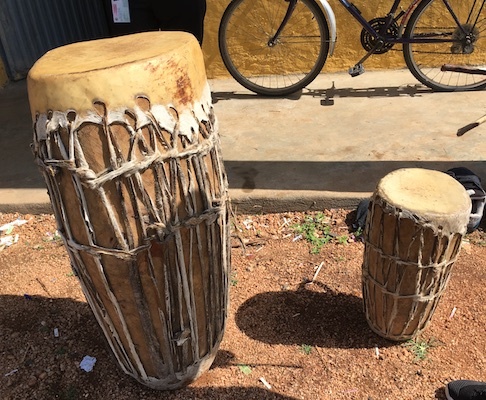 The Anywaa specify three different types of buul: the small one (called aneedo), the medium one (called odoola), and the big one (also called buul; this means that "buul" may refer to drums generally or to the big drum specifically, depending on context). Here is an example of the popular Anywaa rhythm, the agwaa-ga, demonstrated by Ojho and Apay in Gambella wereda. Mha Chang, music producer and owner of Goa Ni Mal Studio, demonstrates on the Nuer buul in Newland neighborhood of Gambella wereda. KRAR (ክራር)፡ The krar is a 5-6 stringed pentatonically-tuned bowl lyre. It is a well-known instrument in Ethiopia and has many iterations across northeast Africa, including in Sudan, Eritrea, and southern Egypt. In Ethiopia, the krar is a core member of the traditional bands and theatre troupes. The strings were formerly made from animal gut but have since been replaced by nylon. An electrified krar is also standard in may urban performances. The krar has two playing techniques, plucked and strummed. In urban settings, I have mostly seen players use a variety of strummed techniques, selectively muting strings with their fingers in order to obtain a defined melody. Yahalem Nod Negussie, krar player at YOD Abyssinia in Addis Ababa, even occasionally plays the strings with his mobile phone to vary the timbre. Generally, however, the krar is played with the left hand, and it is tuned pentatonically (and must be retuned if the player is switching to a different k'ignit.) If the krar has 6 strings, the remaining string is tuned in an octave to the tonic note (e.g. in tizita, it would be C D E G A C). One of the most famous krar players is perhaps the late Asnaketch Worku. The following recording features her playing both plucked and strummed technique as she sings the song, "Inde Eyerusalem" (እንደ ኢየሩሳሌም). THOOM OTIENO: The thoom Otieno (may also be spelled toom, thom, or tom) is the Anywaa term for what is colloquially known as the "thumb piano" (ethnomusicologically known as the "lamellophone.") The term "thoom" by itself may refer to either this lamellophone or the lyre. Adding "Otieno" identifies the lamellophone specifically. According to Apay, "Otieno" label came from a historical figure named Otieno, who was well-known in the Anywaa kingdom for his metal-working. “Otieno” means “spider,” which denotes a crafty guy: spiders are good at spinning webs, as Otieno was good at metal working. Other ethnic groups in western and southern Ethiopia and South Sudan also use this instrument, and, indeed, there are many variants of the lamellophone in eastern and southern Africa. The lamellophone class of instruments consists of metal strips attached to a wooden soundboard and played with the thumbs. Sometimes players add metal rings around the keys to produce a buzzing sound for added aesthetic value. Anywaa players tune the thoom pentatonically, and, historically, the metal strips have been made from umbrella spokes (Osterlund 1978). The instrument is typically used for personal entertainment or for teaching songs to other community members. The thoom Otieno is a bit of a dying art, as younger people are not learning to play it at present. Old men still play the instrument, including Opiew, who lives in Gambella wereda and demonstrates in the following video. THOOM (LYRE): The term "thoom" in the Anywaa language may also refer to the five-string lyre (similar to the krar discussed above). Ochan "Roman" Omaan is known in Pinyudo town for playing this instrument. According to Ochan, the Anywaa adapted it from the Majangir, a neighboring ethnic group in Gambella region. However, he said the playing style of the Anywaa is different from that of other ethnic groups. Like the thoom Otieno, the art of playing this instrument is being forgotten, as younger generations are reportedly not interested in learning to play. Ochan hopes that this will change, as he wants this tradition to be sustained in the future. Osterlund, David Conrad. 1978. “The Anuak Tribe of South Western Ethiopia: A Study of Its Music within the Context of Its Socio-Cultural Setting.” Ph.D. Dissertation, University of Illinois at Urbana-Champaign. Kebede, Ashenafi. 1977. “The Bowl-Lyre of Northeast Africa. Krar: The Devil’s Instrument.” Ethnomusicology 21 (3): 379–95.